Service animal or emotional support animal? There is a Big Difference. Frank wrote those words in 1927 in a letter to Dorothy Harrison Eustis, an American dog trainer living in Switzerland. Eustis had written an article in the Saturday Evening Post about a school in Germany where blind World War I veterans were being trained to work with guide dogs. Frank was subsequently partnered with a German Shepherd he named Buddy. They made news when Buddy led Frank across West Street, a particularly dangerous street in New York City, and later on Broadway during the evening rush. According to The Seeing Eye, over 17,000 partnerships between individuals and dogs have been created since 1929. That’s just one training institution dedicated to training the skyrocketing number of service dogs and emotional support animals. In January of this year, United Airlines refused to let an emotional support peacock board a flight with her owner, demonstrating how broad the definition of support animals has become since Buddy and how they remain very different from service animals. According to the Americans with Disabilities Act (ADA), a service animal is any dog that is individually trained to do work or perform tasks for the benefit of an individual with a disability, including a physical, sensory, psychiatric, intellectual, or other mental disability. Miniature horses can also qualify as a service animal in some case if they have been individually trained to do work or perform tasks for individuals with disabilities. 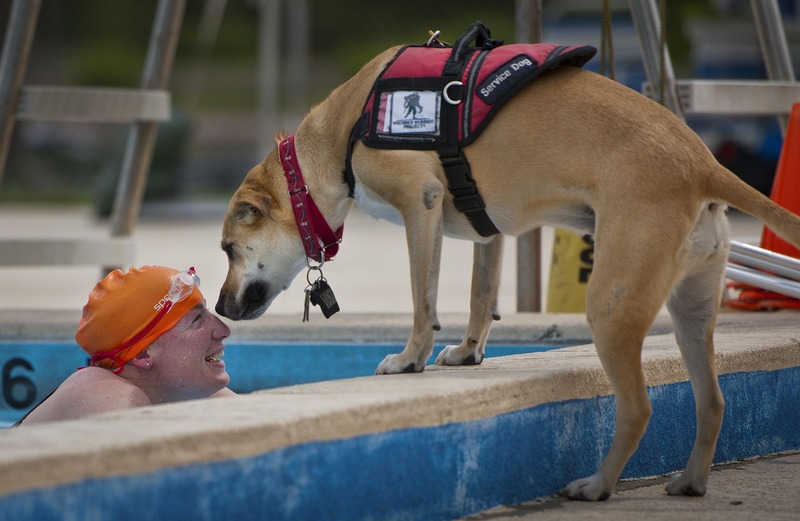 The work or tasks performed by a service animal must be directly related to the individual’s disability. It doesn’t matter if a person has a note from a doctor stating that the person has a disability and needs to have the animal for emotional support. Such a letter does not qualify an animal to be a service animal. • A guide or seeing eye dog serves as a travel tool for persons with visual impairments or who are blind. • A hearing or signal dog alerts a person who has significant hearing loss or is deaf when a sound occurs, like a smoke alarm. • A psychiatric service dog helps detect the onset of psychiatric episodes and lessen their effects. These dogs may remind the handler to take medicine, provide safety checks or room searches, and keep disoriented individuals from danger. • A sensory signal or social signal dog assists persons with autism by alerting the handler to distracting repetitive movements common among those with autism, allowing the person to stop the movement. • A seizure response dog serves a person with a seizure disorder by standing guard over the person during a seizure or finding help. Some have learned to predict a seizure and warn the person in advance to sit down or move to a safe place before a seizure. Training for service dogs can last up to two years and is intense, with some programs reporting a 50 to 70 percent drop-out rate. Service dogs typically wear a vest that identifies them as a service dog and asks the public not to pet or distract them. There is no breed restriction for service dogs, but many programs use Golden and Labrador Retrievers or German Shepherds. A good service dog is not protective, is people orientated, not overly active, confident but not dominant or submissive. The needs of the person normally determine the ideal size or breed based on the work required. For instance, small dogs will struggle to help move a wheelchair or pick up and present objects, while large dogs are hard to put under a table in a restaurant or out of the way on a bus or plane. Emotional support or comfort animals are often used as part of a medical treatment plan as therapy animals. They may provide companionship, relieve loneliness, and help with symptoms of depression, anxiety, and certain phobias. They do not have special training to perform tasks that assist people with disabilities, nor are they limited to dogs and miniature horses. While some states have laws defining therapy animals, these animals are not limited to working with people with disabilities and therefore are not covered by federal laws protecting the use of service animals. The ADA makes clear that there is no national registry for service, emotional support or therapy animal. The American Veterinarian Medical Association also discourages visiting internet sites that will send a vest and certificate for anyone willing to pay the fee. Such practice minimizes the value true service and support animals perform and could put a pet in a situation they are not trained for. So what about traveling with that peacock? The Air Carrier Access Act (ACAA) requires airlines to allow service animals and emotional support animals to accompany their handlers in the cabin of the aircraft. For evidence that an animal is a service animal, air carriers may ask to see identification cards, written documentation, presence of harnesses or tags, or ask for verbal assurances from the individual with a disability using the animal. Emotional support animals may need to provide specific documentation and the reason the animal must travel with the individual. Travelers should contact their airline ahead of time to find out what kind of documentation is required. Buddy, for her part died in May of 1938. She and Frank are immortalized in a bronze sculpture in Morristown, New Jersey. It captures the pair in mid-stride, with Frank motioning his hand ahead as if he is giving Buddy the “forward” command.